As John Wesley, once said, “The world is my parish,” so we as a church believe that our community outreach is our way of reaching the world! We are all over the community in service and invite you to join us! See the faces too often forgotten in our world and give them God’s love – and food. 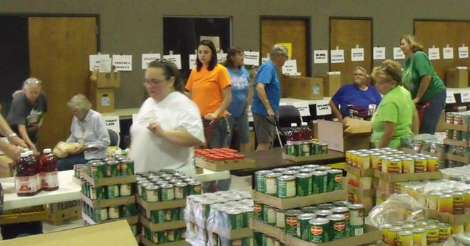 This community ministry serves more than 125 families and more than individuals in our area. Every type of food and staple products are provided on the first Thursday of the month and operates between the hours of 8:00 a.m.-3:30 p.m. Normal office hours for those whom need assistance with paper work or are interested in applying for this service can stop by the church on Tuesday and Thursday between the hours of 9:00 a.m. – 2:00 p.m.
Is helping the homeless or others in need of basic clothing a passion of yours? The Angel Wings Clothes Closet provides free clothing and shoes for men, women, children, and infants in the community (and when requested, to countries abroad like Honduras, Mexico, and the Philippines). Gently-worn clothes, new underwear, socks, and shoes are available. The Clothes Closet is located in a house on Woodland Street, across from the church, and is staffed by our Sisters in Service Women’s Mission group on Saturday mornings. Kairos means “the right or opportune moment.” This national ministry seizes the moment to minister to prisoners in maximum and medium security prisons. Become a part of this program that serves those too often forgotten. Training is provided for those who are willing to accept this challenging and rewarding mission. Our church participates in Kairos weekends by baking cookies, prayer, place mats, financial donations, etc. Foundry House is an outreach ministry in the Cherokee Shores residential development. FUMC Mabank has partnered with the Foundry House and its purpose of providing a safe place for children with our Kids KlubHouse Program. Foundry House has many other ministerial opportunities. For more information, please contact the church office at 903-887-3691.